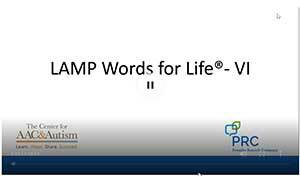 The LAMP Words for Life language system was modified to assist communicators with visual impairments, including tactile cues via a Tactile KeyGuide available for the Accent® 1000, color and icon modifications and simplified motor plans. The combination of the LAMP approach, along with those modifications give individuals with visual impairments an efficient communication system to help them express themselves and expand their language. The LAMP Words for Life – VI language system is available along with LAMP Words for Life on all PRC Accent devices..
A set of high-contrast Minspeak icons with less detail and fewer colors were set on a black background. Some motor patterns were simplified. Words learned at the one-hit level become double hits on the same button to eliminate the need for tactile search. Since the corners provide a good reference point, they were left blank in LAMP Words for Life – VI to be utilized for customization of favorite people, places and things. A tactile KeyGuide with raised cues to reference locations was developed for the Accent 1000.